An artist sets up an easel and brings out his paints along Rue Saint-Amable in Old Montreal in Quebec, Canada on a beautiful summer day. Tourists stop and admire the work that this artist creates and many of his pictures are sold along this attractive street. Artist at work along Rue Saint-Amable, Old Montreal, city of Montreal, Quebec, Canada. 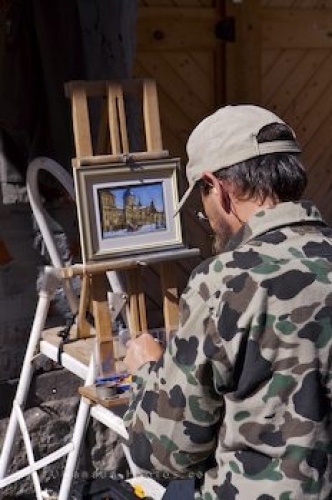 Picture of an artist hard at work along Rue Saint-Amable in Old Montreal, Quebec in Canada.